The eagle feather headdress is a relatively new attribute among American Indians, it became rapidly widespread in the late 19th century. 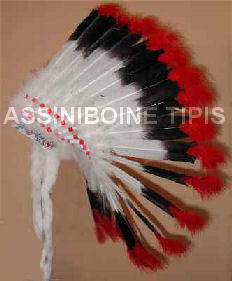 It would appear, but nothing has been proven, that the Crow tribes used the first eagle feather headdress. The Sioux, who originally came from the Great Lakes region, may have used it following their migration to the plains where they became the buffalo hunters that we know better today. This style was later adopted by the Blackfoot Indians in the early 1800s, then by the	Pawnee in 1821, and by the Cheyenne about 1830, as evidenced by the paintings of Catlin. It was not adopted by the Sioux until the mid 19th century. 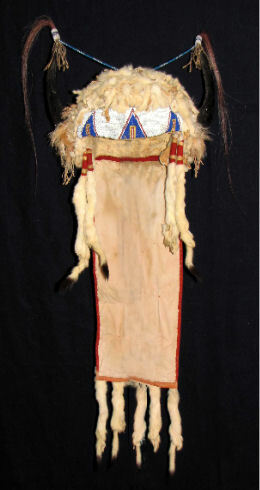 This 32-feather headdress has a leather cap, and is decorated with	a	glassbead	headband.